With the launch of its first in-house Manufacture Flyback Chronograph at Baselworld 2015, Alpina celebrated an important première in its 132 years history. 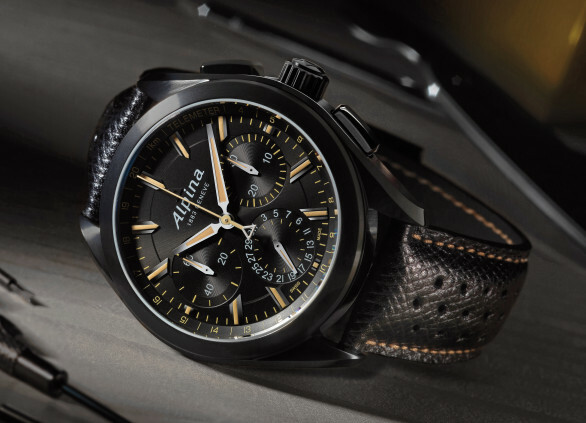 With its AL-760 patented “Direct Flyback Technology” automatic flyback caliber, Alpina not only introduced its first in-house chronograph caliber, but also innovated and ingeniously simplified the flyback and return to zero mechanism. As a 2016 Baselworld novelty preview, Alpina is now proud to present its new full black AL-760 Alpiner 4 Manufacture Flyback Chronograph. Traditionally, the industry recognises two different modes of construction of a chronograph mechanism: integral and modular, fixed to the watch movement. The latter has the advantage of offering greater flexibility, as it can be fitted, after appropriate adaptation, to a wide variety of hand-wound and automatic calibres. Furthermore, the chronograph assembly can be pre-mounted and tested independently of the “power unit” used, and if necessary even completely replaced. This saves time and hence also costs. Over three years went by in the Swiss mountains between the initial concept and readiness for production. For the new Al-760 caliber the technicians decided to adopt a modular construction based on the reliable and robust AL-710 caliber, which features a balance frequency of 4 Hertz, centre seconds and a date hand at 6 o'clock. The Al-760 powerful movement, comprising 233 components (on which only 96 components for the flyback module) with a rotor operating in both directions and a 38-hour power reserve, is particularly suitable for a drive mounted at the front, immediately below the under-dial work. The ingenious construction of the chronograph mechanism is apparent not least from the fact that Alpina was able to create it from only 95 parts. An unmistakeable characteristic of high-quality chronographs is a column wheel rotating on bearings to control the three start, stop and reset functions. In conventional mechanisms, this component has several columns. In contrast, the calibre AL-760 has no standard-type column wheel, but a star-shaped one. Together with the operating lever, which is controlled by the start/stop push-piece, this component is responsible for the exceptionally smooth operation of the mechanism. The absolutely essential part in all chronographs is the clutch. Its function is to establish the connection between the power source, that is the watch movement, and the gearing, or under-dial work, when required. To achieve this end, watchmakers are acquainted with three different designs: the classic horizontal wheel coupling, the oscillating pinion, also traditional, and lastly the modern vertical friction clutch. Symbolic of the ingenuity of the AL-760’s designers is a new type of swivelling component with two toothed pinions. When the button is pressed, it connects the two “storeys” together. At the lower level, in the watch movement proper, it takes up the rotation of the centre seconds and conveys this, via the corresponding upper component, to the actuating mechanism to turn the chronograph hands. At the same time, the lower central seconds also drives the seconds hand at 9 o’clock, which turns continuously in unison. The rotations of the chronograph hand are “recorded” by the 30-minute counter at 3 o’clock. Repeating pressing of the start/stop push-piece causes slight pivoting of the clutch lever. The chronograph stops. At the same moment, for perfect legibility, a small locking lever ensures that the two stopping hands pause exactly at the last position chosen. If desired, this stop operation can be repeated as often as wished with the upper push-piece. Specialists know this as a cumulative split. The chronograph will not be reset to zero until the push-piece at 4 o’clock is actuated. Here again, the ingeniously contrived construction of this newcomer among chronographs is evident. As a recognized specialist in pilots’ watches, Alpina equipped the calibre AL-760 with a split-seconds function. Also known by the name of “flyback”, this function was invented in the 1930s to make it easier for pilots to use this most essential of instruments. With this function, pressing the push-piece just once starts the timer again from zero. In this case, the push-piece at 4 o’clock and its associated mechanism cause three tasks to be performed very quickly one after the other: first, the clutch is disengaged; secondly, the chronograph is reset to zero by means of the single-piece hammer, whose sloping surfaces turn the two zero reset hearts so that the hands position themselves vertically again; and thirdly, the clutch engages once more as soon as the push-piece is released. The highly complex sequence of movements involved in this case proceeds directly from the push-piece to the clutch lever. This instant type of flyback is another instance of the unique details of construction of the new calibre AL-760. And last, but not least noteworthy, are the carefully designed shape and the mode of attachment, not by a force-fit method, of the chronograph module to the basic watch movement. It achieves a reliable and, above all, energy-saving connection between the two mechanisms, both of them produced in-house. And to conclude, the very legible date hand at 6 o’clock avoids the unsightly well through which the date disc rotating on the front of the basic movement must be read on modular chronographs of conventional construction. Like all the Alpina watches, this one too was shaped into a precision instrument, which features ergonomically shaped chronograph push-pieces, screw-down winding and setting crown, and scratch-resistant sapphire crystal. It can withstand a water pressure of up to 10 atmospheres, equivalent to a diving depth of 100 metres. Following a long tradition, the screwed steel case back is decorated with the familiar Alpina logo. Looking at the right-hand side of the case, connoisseurs will immediately notice that the crown and push-piece are positioned on a straight line, despite the calibre AL-760’s modular construction. To finish this watch, an elegant black genuine leather strap with beige stitching ensures safety and comfort on the wrist. Alpina is one of the very few independent Swiss watch companies, which develops, produces and assembles its movements entirely in-house. Alpina proposes five in-house calibers: the AL-980 Tourbillon; the AL-718 World Timer; the AL-950 Automatic Regulator; the AL-710 Automatic Small Date, and, most recently, the AL-760 Flyback Chronograph, featuring the new and patented “Direct Flyback” technology.